Last year Community star Donald Glover launched a Twitter campaign to land an audition for The Amazing Spider-Man, but unlike the similar Twitter movements that successfully ousted Mahmoud Ahmadinejad from Iran through the combined force of green profile photos, and Obama’s recent debt-ceiling “#compromise” campaign, and, uh… Actually, like every Twitter campaign ever, it failed. But unlike so many others who have seen their hash-tagged dreams dashed, Glover will get the chance to play Spider-Man, sort of, serving as Brian Michael Bendis’ inspiration for a new era of the character that kicks off with tomorrow’s Ultimate Fallout #4. 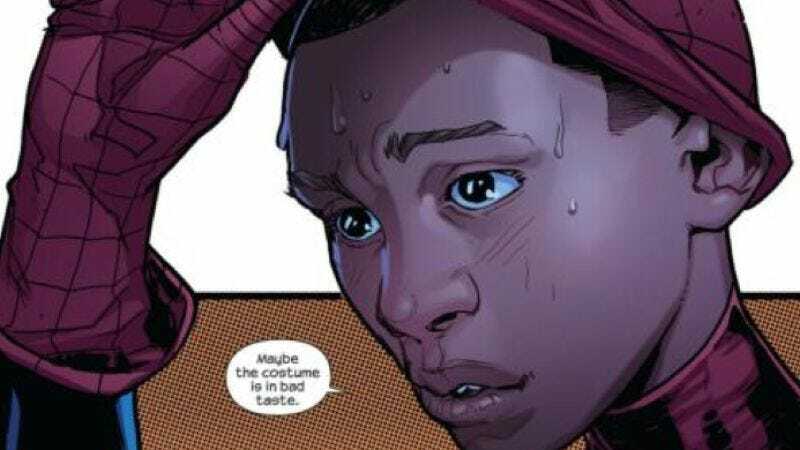 Bendis says he gives Glover “mucho credit” for the look of Peter Parker’s successor, having seen Glover wearing Spider-Man pajamas in last year’s Community season premiere as a jokey nod to the Twitter campaign, then used him as the basis for Miles Morales, a teenager who hails from an African-American and Hispanic background. So anyone who participated in the #donaldglover4spiderman petition should feel a sense of accomplishment. Go ahead and take the rest of the day off.